Cy Young was the most successful pitcher in baseball history, setting the all-time record for wins, innings pitched, and complete games. He also won 30 or more games in a season five different times and threw the first perfect game of the modern era. The demand and value of Young's trading cards match his level of success on the mound. This list compiles some of the most significant Cy Young baseball card appearances. 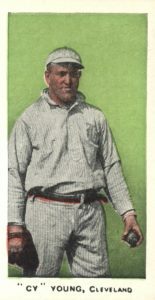 Young's career served as a bridge between the first era of professional baseball to a sport that resembled the modern game. His early dominance helped push the league to move the pitching mound back five feet to the current distance (60 feet 6 inches). Young topped 20 wins in 15 seasons and he finished his career with 511 wins across 22 years. He was selected to the Baseball Hall of Fame as part of their second class in 1937 and was further honored by the creation of the Cy Young Award in 1956. Shop for Professionally Graded Cy Young cards on eBay. While the value of each card on this list can eclipse several hundred dollars, Young has many appearances that are much more budget friendly, including multiple Topps cards. The 1973 Topps set features a few cards honoring baseball's record holders and Young is included as the victories leader. He again appears in 1979 Topps and shares a card with Jack Chesbro who holds the record for wins in a single season with 41. In addition, 1972 Topps has a card honoring the Cy Young Award which is given to the league's best pitcher. The award began in 1956, one year after Young's death in 1955. For fans of the defunct Cleveland Spiders team where he began his career, Young's card in 2010 Topps National Chicle has a spider crawling down the side. Cy Young firmly remains in the top tier of baseball superstars from his era with all of his tobacco cards attracting huge prices. As many likely know, cards from his playing days are also incredibly rare. Card value, as well as the card's design, are key components in determining the selections and placement on this list. We begin our list with a Cy Young card that doesn't actually feature Young at all. 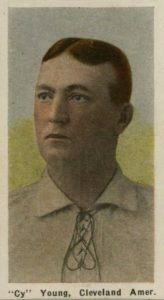 Young's 1910 E98 card features a pitcher named Irv Young who bares a slight resemblance to the winningest pitcher in baseball history. 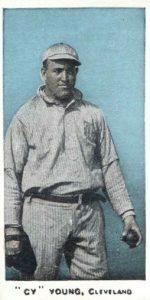 Irv Young even earned the nickname "Cy The 2nd" with his incredible pitching performances during the 1905 and 1906 season so it is understandable how this error could have happened. This has become one of the most valuable error cards ever produced and collectors can find a whole host of color variations like the blue, red, and green versions shown below. 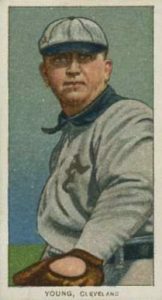 The Sporting News began inserting these large M101-2 cards into their magazine in 1909 and would continue to issue them on and off through 1913. Thankfully, the publication included release date information at the top of each card. 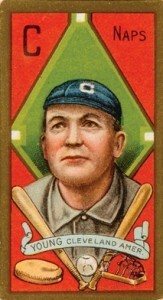 Therefore, we know that Cy's card was the second issue overall and it was made available on July 29, 1909. 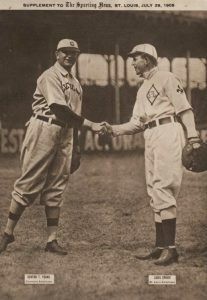 Young is featured shaking hands with his Boston Americans teammate Louis Criger who was Young's long-time catching partner. While The Sporting News was inserting large photo cards, their competition at Sporting Life magazine decided to issue tobacco-sized mini cards in groups of a dozen at a time. 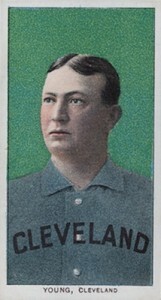 The cards in the 1910-11 M116 set were color-tinted, black-and-white photos and could be purchased for four cents. In total, nearly 300 cards were issued. 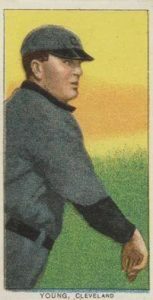 Young's card features black and blue color variations on the back of the card. It is thought that the blue color was from a second printing. The Standard Caramel Company of Lancaster, Pennsylvania put out 30 cards in 1910 featuring many of the top stars of the day. Young's bright yellow card is unique as it appears to show Young holding a bat rather than his typical fielding glove. The cards in the E93 set themselves are unnumbered but each card features a complete 30-card checklist on the reverse side with Young being given #30. The bright red "B.A." 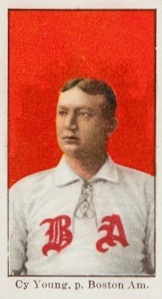 across Young's chest on his 1909 American Caramel card stands for the Boston Americans. Of course, the team would become the modern Boston Red Sox in 1908. Young pitched for the Americans from 1901 to 1908 before he was traded to the Cleveland Naps in 1909. Young also has a separate card in the set featuring him with the Naps. These cards, which were colorized black-and-white photos, came in packages with sticks of caramel. Along with the unique gold leaf design, 1911 T205 was also a groundbreaking set on two fronts. National League player cards featured the first use of a facsimile signature on the card's front and the reverse side of both AL and NL cards included the player's full name for the first time ever. While you might assume "Cy" was short for "Cyrus," Young's full name is actually Denton True Young. He was given the nickname "Cy" as a shortened version of the word "cyclone" because of his powerful pitching speed. The 1910-1911 Turkey Red cabinet cards stand out as some of the most beautiful cards produced during the tobacco era or any other. The colored lithographs with their famous gray borders remain very popular today and Topps continues to produce sets using a similar design. The first 50 Turkey Red cards (including Young) were issued in 1910. These early cards from the set have two back variations featuring a checklist, including one with and one without ordering instructions. Like many stars of his day, Young is found on multiple cards in the famous T206 set. 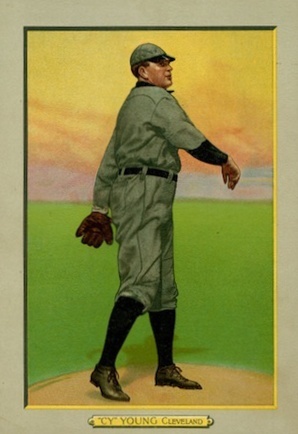 Young's three cards include two action shots of him pitching and they have become known to collectors as the " bare hand" and "glove shows" cards. The third card is a colorized version with a green background of the famous Young portrait that was frequently used on his cards of the time. While the two pitching cards hold roughly the same value, Young's portrait card doubles that price for collectors. 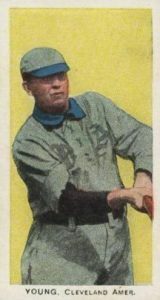 While many notable players of the era have their first baseball cards in the Breisch-Williams set, Young's cardboard debut amazingly came nearly a decade earlier. The Breisch-Williams cards came from a confectionary company with the same name located in Oxford, Pennsylvania. These cards seem to have been used for a contest since there have been many examples found that have the "Breisch-Williams" name stamped across the back as if the cards were canceled after being redeemed. Those stamped cards hold a value of two to three times that of the standard card. Young's first baseball card is one of the rarest and most sought-after cards ever made. It is so rare that there really isn't an established value for the card itself as there have been no public auctions. 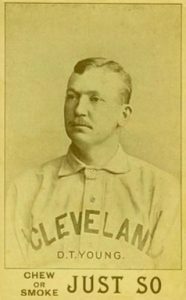 Featuring players on the short-lived Cleveland Spiders, the 15-card set was produced in 1893 by the Just So tobacco brand. For almost 70 years after its release, it remained largely unknown to collectors and only a few copies of each card in the set came to light. 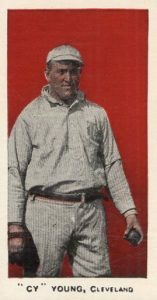 Although not as famous as Honus Wagner's T206 card, an auction for Young's card might one day rival it as the most expensive card ever purchased. 1950 CALLAHAN CY YOUNG PSA 9 MINT CENTERED! LOW POP! SMR $350! 1 HIGHER!